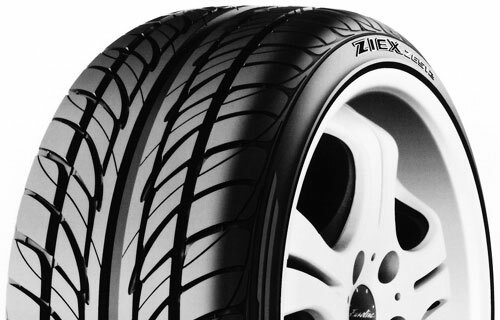 The Eagle GT-HR is Goodyear's High Performance All-Season radial designed to be sporty, durable and attractively priced. The Eagle GT-HR was developed to blend good treadwear, responsive handling and dependable traction on dry and wet roads, as well as in light snow. On the outside, the Eagle GT-HR features independent tread blocks molded into a directional tread design to help pump water through the tire's footprint to increase hydroplaning resistance and wet traction, while lateral grooves and multiple tread block sipes increase the number of biting edges to enhance wet road and light snow traction. Sequencing tread block shapes and sizes reduce road noise to increase driving comfort. On the inside, the Eagle GT-HR features twin, high-tensile steel belts on top of Goodyear's RaceWrap Construction Technology developed for the Eagle Race tires used in NASCAR competition. RaceWrap Construction Technology brings a casing ply down the sidewall at a slight angle, wraps around the bead and returns it all of the way up the sidewall until it ends under the edge of the steel belts. This slightly angled, two-ply sidewall promotes steering response, handling stability and durability while the single ply under the tread reduces tire weight. The Goodyear Eagle GT-HR radial's sidewall styling features black letters reversed out of a serrated circumferential band, and is available in 65-, 60-, 55- and 50-series, H-speed rated sizes in 14" through 16" rim diameters.